Air New Zealand reported its third consecutive year of profit growth in the FY to 30-Jun-2014. The contrast is obvious with Qantas, which has announced a massive headline loss of AUD2.8 billion (although an underlying loss which improved considerably on analysts' expectations). But the reality is the three hours that separates Sydney from Auckland also significantly changes market conditions that account for the difference in fortune. Air New Zealand faces no major competitor in its core domestic market while in the long-haul market competition is significantly lower and strong partnerships dominate. Air New Zealand is not resting on its laurels, with a projected 6% ASK growth in FY2015. Domestic, trans-Tasman and North America growth will be below average, Europe flat, and Asia above average as Air New Zealand resumes Auckland-Singapore flying as part of its approved JV with Singapore Airlines. Aside from the Singapore route, most growth will occur through capacity up-gauging as larger aircraft replace smaller ones, reducing growth risk and hefty route start-up costs. 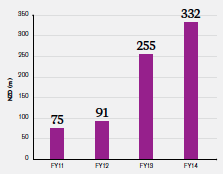 In FY2014, the year to 30-Jun-2014, Air New Zealand grew ASKs by 0.7% while RPKs grew 1.2%. Passenger revenue grew at a faster 2.3% although group revenue increased by only 1%. Cargo revenue declined by 4.7% due to increased capacity and lower yields while contract services and other revenue declined by 4.4%. However, passenger operations are the core of the Air New Zealand business, to a greater extent than at other airlines. Passenger revenue accounted for 83% of all group revenue in FY2014. Domestic yields increased 2.8% from already high levels while international (long-haul) yields grew 0.9%. International load factor improved 1.4ppts as capacity decreased faster than passenger volume. However, domestic load factor fell 1.5ppts as capacity growth outstripped demand, although growth was high in relative terms for Air NZ. Going forward, Air NZ sees New Zealand's economic growth underpinning domestic capacity growth without the need to stimulate fares. The trans-Tasman and Pacific Islands market saw decreases in load factor and yield largely as a result of the lower Australian dollar. Group ASKs were up 0.7% in FY2014. North America/Europe was the largest source with 7% growth. Air NZ lists Asia as having 8% growth, but this excludes the exit of two unprofitable routes: Hong Kong-London and Auckland-Osaka. In FY2015 Air NZ expects 6% ASK growth. Domestic and trans-Tasman will be below average with 5% and 3% growth respectively. Air NZ will cool down on North America, which has been a growth market for a few years, including 7% ASK growth in FY2014. 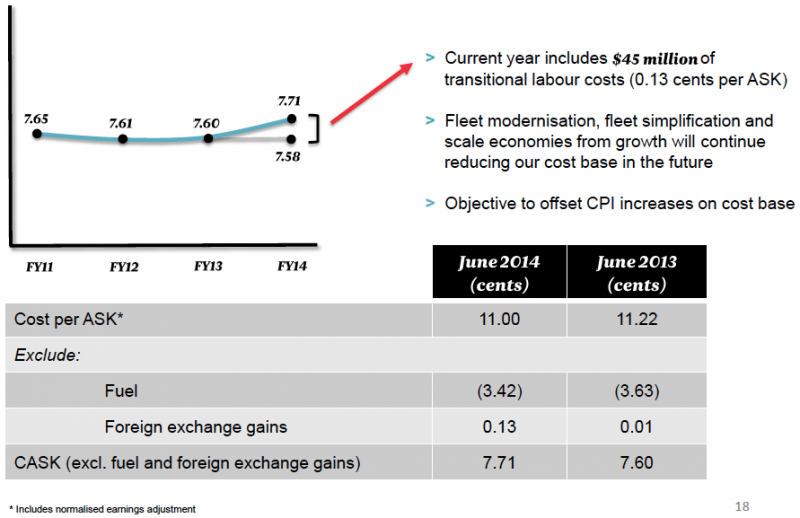 Air NZ expects FY2015 ASK growth to be 2-4%. Europe will be flat as Air NZ maintains daily Los Angeles-London Heathrow 777-300ER service. Air NZ did not break out Asia growth, but this will be well above average. Driving the growth are two factors. First, Air New Zealand will re-launch Auckland-Singapore service with 777-200ERs as part of its joint-venture with Singapore Airlines, for which approval was granted earlier in Aug-2014. Air NZ had served Singapore previously but without a close partnership with SIA, which made the route unsustainable. Air NZ's re-entry does mean it is adding a long-haul route. While long-haul routes traditionally come with large start-up costs, the partnership with SIA means Air NZ expects "good yields from day one" and will not have the usual performance build-up curve that accompanies new routes. This reduces risks and costs. CEO Christopher Luxon announced the Singapore route will resume on 06-Jan-2015, a slight delay from the earlier Dec-2014 projection. Second, Air NZ expects growth in Asia through up-gauging. Higher-density 777-200ERs replace lower-density versions while 767-300s will be replaced by 787-9s. Air NZ's China market, comprising an Auckland-Shanghai flight, should see a performance boost as Air NZ replaces its 767-300 (old business class and without premium economy) with 787-9 (new business class and with premium economy). Yield mix should improve with the better products. Air NZ has been growing in Japan, sensing other carriers have been removing capacity, leaving a void for leisure capacity. Air NZ says it has been happy with the growth so far and concentrating on the Tokyo market, which has made Tokyo the "standout" in Air NZ's Asia market. Up-gauging is the story across Air NZ's growth. Larger A320s are replacing 737-300s (and delivering efficiency improvements). Likewise ATR72-600s are replacing 72-500s. Air NZ has announced an order for its first A321s, which will also facilitate up-gauging. The ATR fleet serving regional New Zealand destinations is seeing a relatively large net increase, reflecting opportunity but also social need to grow and reduce accusations of keeping fares high in what is effectively a monopoly market. But elsewhere fleet growth in terms of frames is limited. In FY2015 Air NZ expects a widebody fleet of 23 aircraft that is planned to grow to 25 by the end of FY2019. Air NZ's narrowbody jet fleet will grow from 28 in FY2015 to 29 in FY2019. The bigger story is efficiency, as Air NZ transitions from three widebody types (747/767/777) to a 777/787 family that shares commonality. Ageing 747s and 767s will leave the fleet while A320s are replacing 737s, and in turn will be replaced by the A320neo family. From FY2013 to FY2014, scheduled frequencies decreased by 1%, further highlighting Air NZ's growth through lower risk up-gauging. Air New Zealand's strength compared to Qantas' weakness and ongoing re-structuring has naturally led to questions whether Air NZ can benefit from Qantas' re-structuring. The answer is Air NZ could see limited to no benefits. Air NZ's geographic advantage is in the Australia-North America market. Qantas has already withdrawn from Melbourne-Auckland-Los Angeles services, which handed Air NZ a direct benefit on which it quickly capitalised. Elsewhere, Qantas is growing in 2014 with increases to Dallas and extra services between Melbourne and Los Angeles. The Melbourne-Los Angeles capacity, in addition to United's 787 non-stop, will likely negatively impact Air NZ, which had a small but worthwhile position in the transfer Melbourne-Auckland-Los Angeles/San Francisco market. Air NZ could have an advantage to Latin America, being geographically closer, but Qantas is growing its Santiago service while Air NZ remains absent from the Latin America market, partially due to the lack of viable partners. Mr Luxon said Air NZ remains interested in Latin America, but that no solution is apparent in the short/medium-term. Qantas is weak in Asia but serves more points than Air NZ. Further, Asia-Auckland-Australia connections are circuitous and traffic volume is low. Air NZ could benefit from Qantas' re-structuring by changes at Qantas positively impacting Virgin Australia. Air NZ owns 25.99% of Virgin Australia, the maximum under the current protocol. Mr Luxon was appointed to the Virgin board on 04-Jul-2014, joining his counterparts at Etihad Airways and Singapore Airlines, which also have a stake in Virgin. Air NZ from FY2015 will include its share of Virgin's results in its own. Virgin has been loss-making and Mr Luxon deferred questions on Virgin's prospects and when Virgin will make a profit. Air NZ's earnings projections are independent of Virgin's performance, which could have a large impact on Air NZ. Cargo is a small component of Air NZ's business, and has been changing. The Hong Kong-London suspension took out cargo capacity while new widebody jets are coming with larger cargo capacity than the aircraft they replace. Air NZ does not operate any dedicated cargo aircraft, making its cargo capacity relatively cheap to sell. Yields have decreased in line with market averages but also due to Air NZ's growing cargo capacity. The carrier expects yields to continue to fall as more cargo capacity comes online. There could be gains in specific markets. In China, for example, Air NZ's 767 to Shanghai can depart full. Shifting to the 787-9 will create certainty for prospective cargo shippers. Air NZ is generally upbeat on cargo demand destinations being in line with where its passenger growth is. Air NZ is bringing focus to its loyalty division and the prospect for earnings there to be high margin and outstrip the flying business. Air NZ expects its loyalty business to grow through channels like shopping malls (where partners pay Air NZ to award points for purchases) but mainly financial partners. Air NZ deemed its loyalty points an "attractive currency for credit cards", as other (but not all) airlines have been finding for a while. Qantas and to a lesser extent Virgin Australia have been bolder in the region in pursuing loyalty business opportunities. Geography, competition and alliances are a key part of the difference between Qantas and Air NZ, but so too is costs. Air NZ over the past decade has undergone a restructuring that has taken many costs out of the business and made it relatively efficient. 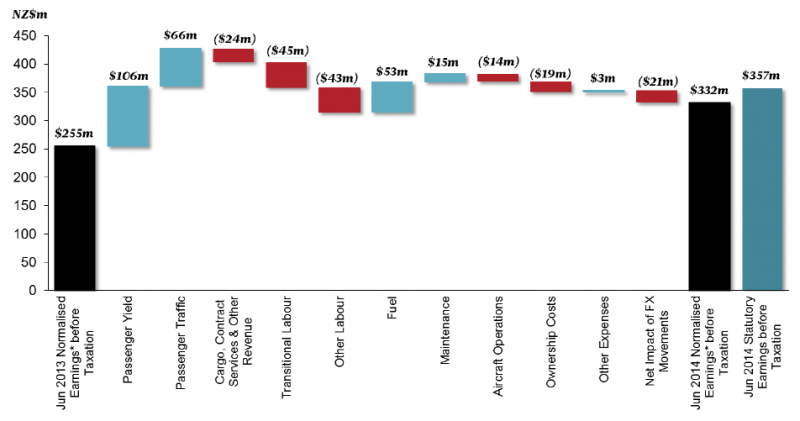 Qantas on the other hand is only now tackling a cost base that has not been radically altered since privatisation. Air NZ saw an unwelcome increase in CASK in FY2014, although it attributes this to fuel and foreign exchange impacts, without which its CASK would have decreased. As a worst case scenario, Air NZ expects FY2015 CASK excluding fuel and foreign exchange to be flat. More optimistically, CASK will fall as Air NZ gains the benefit of its simplified fleet and moves past one-off impacts in FY2014 related to restructuring. However, Air NZ acknowledged there could be further redundancies in FY2015 (at a lower amount than in FY2014) and those would have a cost impact, although Air NZ did not state any definitive plans. The outlook at Air NZ continues to be bright. Its core domestic market is unlikely to see serious competition. The Tasman has effectively become a duopoly between Air NZ/Virgin Australia and Emirates/Jetstar/Qantas. International long-haul growth will be low risk. Competition could quickly send things awry. Air NZ is a tough little competitor in its own patch, with a low cost base and a strong product. It can see off most point to point long-haul airlines, but remains vulnerable to large airlines that are able to adopt a long term strategic position. As Chinese carriers ramp up capacity, or the possibility of a North American carrier serving New Zealand eventuates, Air NZ's fragility can be exposed. However, just as Air NZ has tackled previous challenges with partnerships, new disruptions could also be met with a partnership. Growing non-flying revenue, such as loyalty, is far more alluring even if it is not what boards and investors traditionally look for. Then again, Air NZ has hardly been a traditional carrier. It has put its house in order over a period of years, has a unique competitive environment, remains committed to growth, is innovative and continues to generate strong employee morale and customer satisfaction. Perhaps Air NZ's biggest challenge is retaining the public limelight in the face of a "boring" story of stability and strong performance. No doubt Auckland prefers that over the more exciting scenario across the water in Sydney.